Get to Know New Snackies! Boxes of goodies automatically shipped each month like a magazine subscription are all the rage, and now Thrive Life has a similar offering for customers. Snackies are a selection of various freeze-dried foods in small pouches that are the perfect size for snacks, packing in lunches, or including in emergency kits. You can select from a nice variety of tasty snacks and fill your Snackies box with 5 varieties — mix and match however you like. That set of snacks will be delivered to your door each month, and you can always make changes before the next shipment. I’ve found that this is an inexpensive way to try any number of foods before ordering larger quantities and it’s always nice to have something in the cupboard at arm’s reach when one of the kids gets hungry! My family and I have enjoyed the Yogurt Bites, Coconut Bites, and Freeze Dried Corn (always a favorite). Check out the entire line of Snackies here. Are you a Thrive Life fan, too? Let me help you plan your food storage pantry! I'll send you my "Top 14 Tips For a Balanced Pantry" and occasional notices of Thrive Life sales and other promotions because I'm a fan, too! 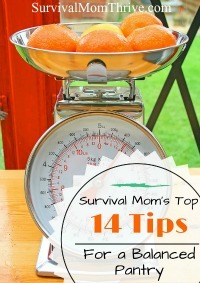 Get my "Top 14 Tips For a Balanced Pantry" as a thank you for visiting my site! PLUS, you will receive occasional notices of Thrive Life sales and other promotions.